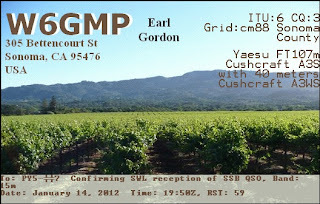 eQSL recebido: KG2RA, Mt. 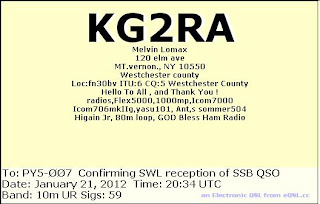 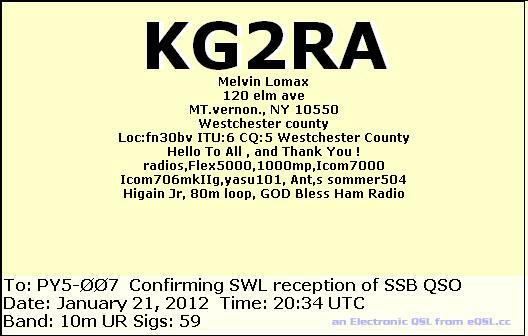 Vernon, NY, United States, 28 MHz, QSO w/ VE5ZX. 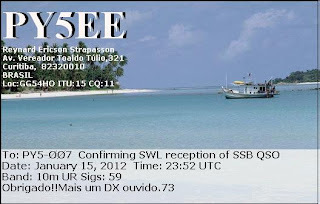 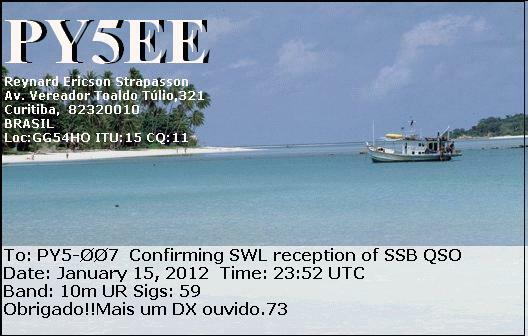 eQSL recebido: PP5FMM, Florianópolis, SC, Brasil, 28 MHz, QSO w/ HK0NA (Malpelo Island). 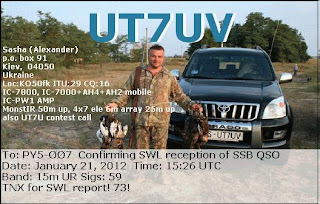 eQSL recebido: UT7UV, Kiev, Ukraine, 21 MHz, QSO w/ KJ4VTH (only spot), NX7TT. 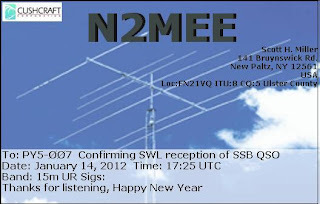 eQSL recebido: N2MEE, New Paltz, NY, United States, 21 MHz, QSO w/ PJ4C. eQSL recebido: DK5WL, Stromberg, Germany, 14 MHz, QSO w/ PY7XC. eQSL recebido: WA8Y, Midland, MI, United States, 14 MHz, QSO w/ 3DA0NJ. 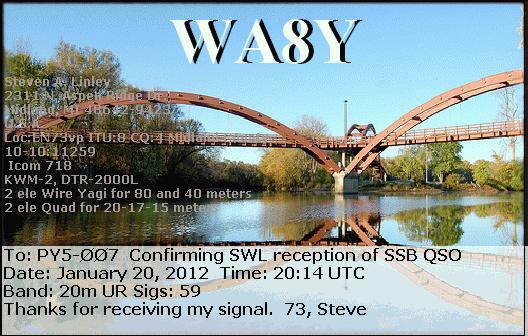 eQSL recebido: WA8Y, Midland, MI, United States, 14 MHz, QSO w/ PY7XC. 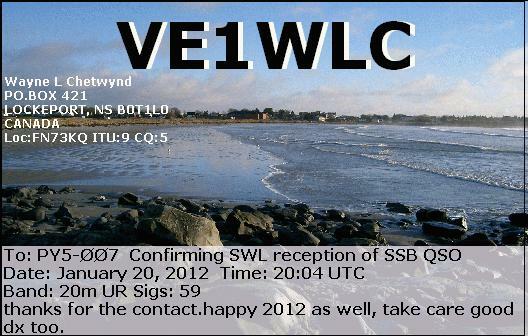 eQSL recebido: VE1WLC, Lockeport, NS, 14 MHz, QSO w/ 3DA0NJ. 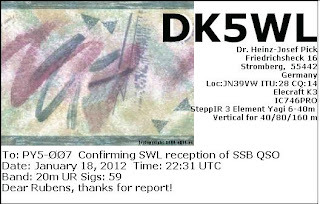 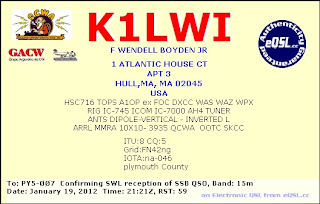 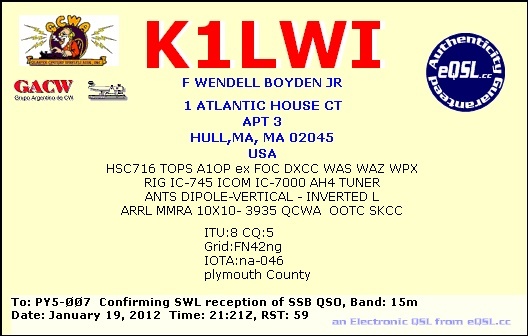 eQSL recebido: K1LWI, Hull, MA, United States, 21 MHz, QSO w/ HK0NA. 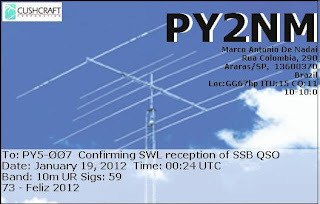 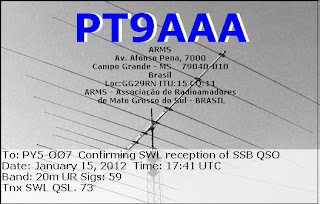 eQSL recebido: PY2NM, Araras, SP, Brasil, 28 MHz, QSO w/ NP2KM. 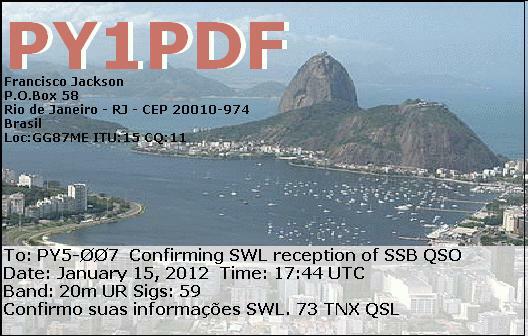 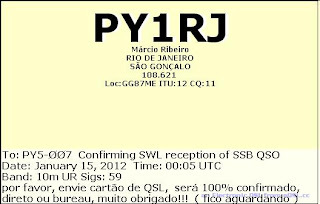 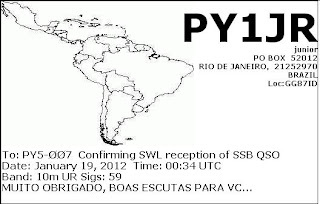 eQSL recebido: PY1JR, Rio de Janeiro, RJ, Brasil, 28 MHz, QSO w/ NP2KM. 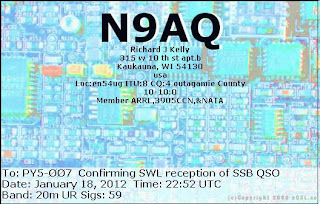 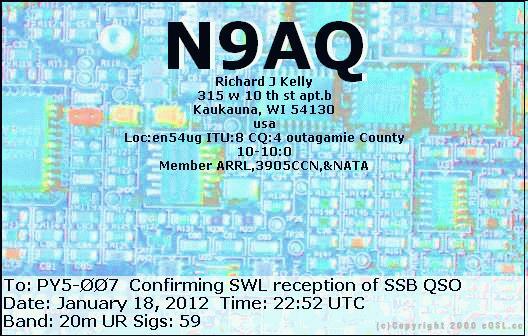 eQSL recebido: N9AQ, Kaukauna, WI, United States, 14 MHz, QSO w/ PY7XC. 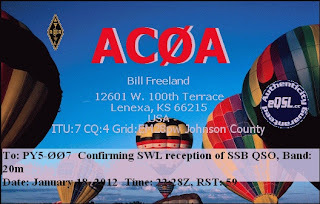 eQSL recebido: AC0A, Lenexa, KS, United States, 14 MHz, QSO w/ PY7XC. 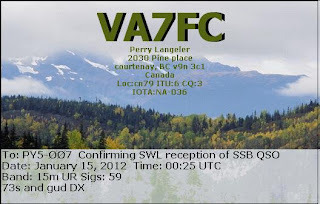 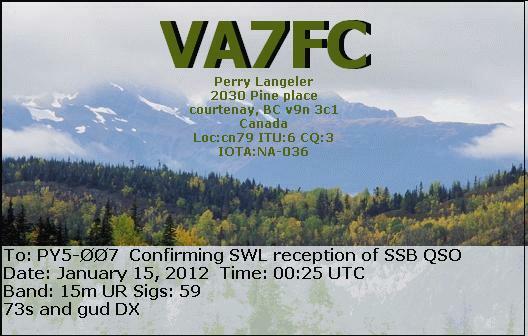 eQSL recebido: VA7FC, Courtney, BC, Canada, 21 MHz, QSO w/ BX5AA. 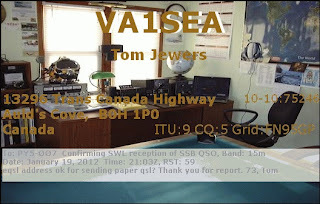 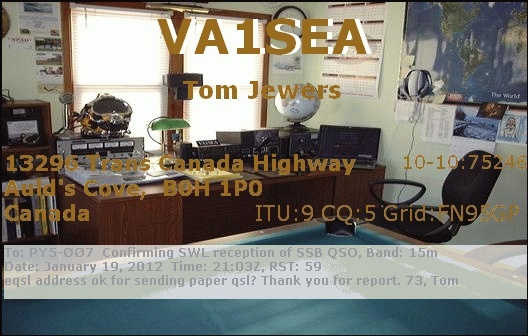 eQSL recebido: VA1SEA, Auld's Cove, Canada, 21 MHz, QSO w/ HK0NA (Malpelo Island). 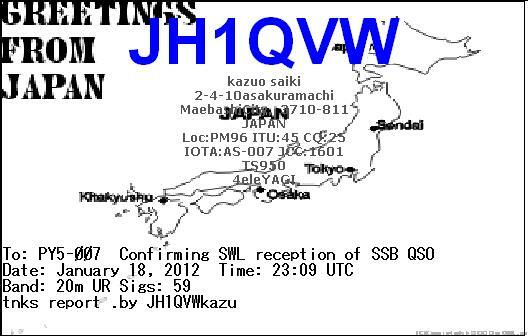 eQSL recebido: JH1QVW, Maebashi City, Gumma, Japan, 14 MHz, QSO w/ PY7XC. 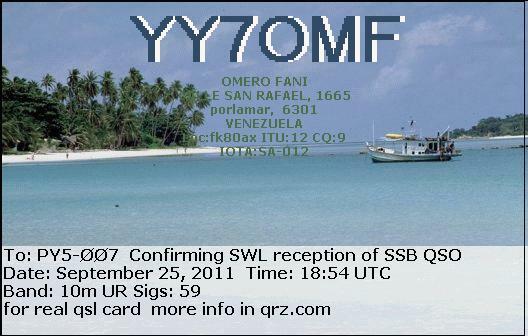 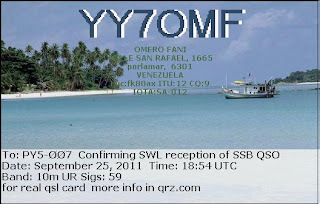 eQSL recebido: YY7OMF, Porlamar, Marguerita Island, Venezuela, 28 MHz, QSO w/ LU7YS. 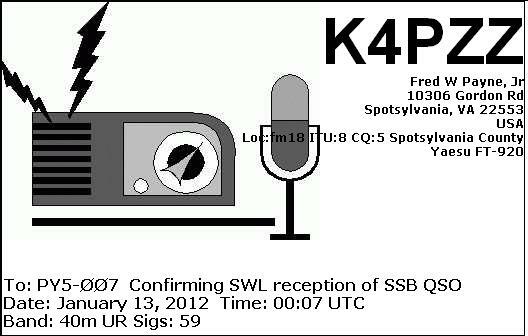 eQSL recebido: K4PZZ, Spotsylvania, VA, United States, 7 MHz, QSO w/ PY6HD. 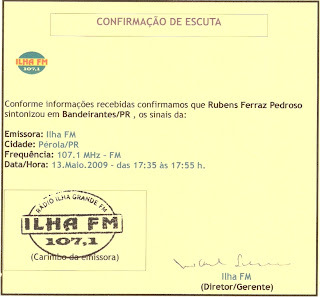 Rádio Ilha FM, 107.1 MHz - Pérola/PR. 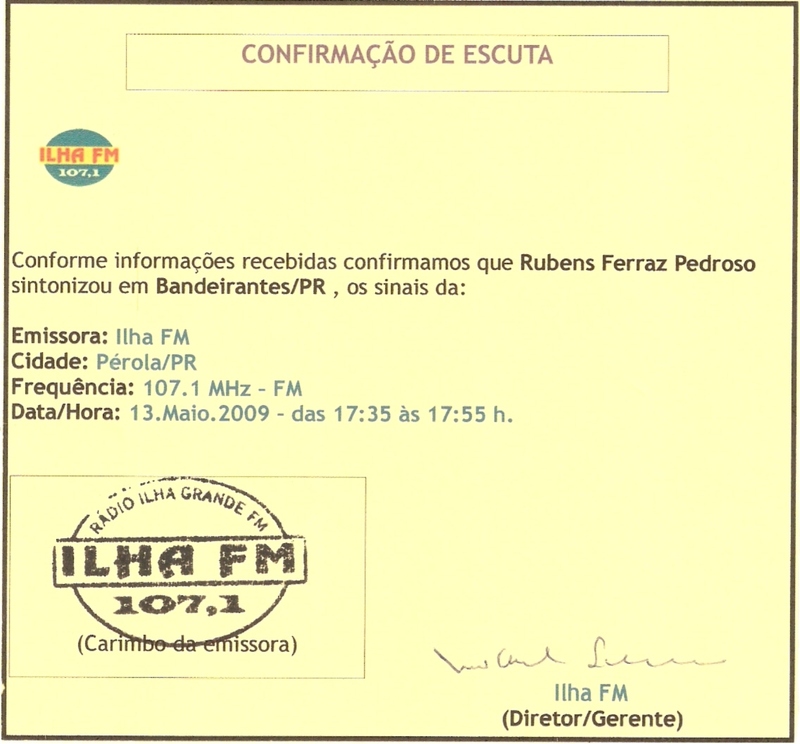 (Rx: Sony ICF SW 7600G/ Ant: RC3-FM). 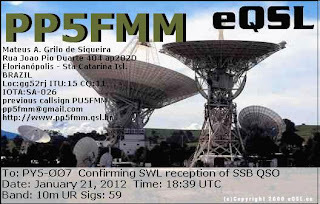 eQSL recebido: PY5EE, Curitiba, PR, Brasil, 28 MHz, QSO w/ JA1OJJ. eQSL recebido: PY1RJ, São Gonçalo, RJ, Brasil, 28 MHz, QSO w/ JA1OJJ. 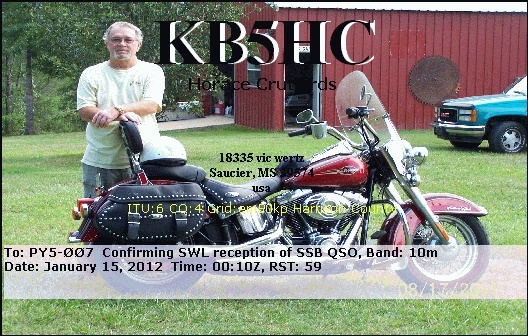 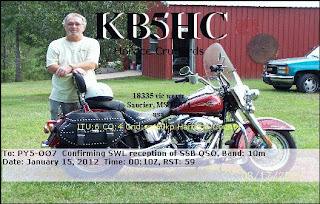 eQSL recebido: KB5HC, Saucier, MS, United States, 28 MHz, QSO w/ JA1OJJ. 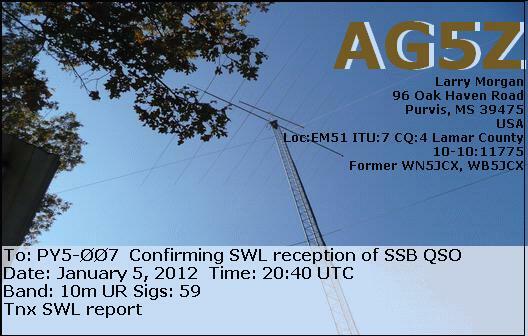 eQSL recebido: AG5Z, Purvis, MS, United States, 28 MHz, QSO w/ YY2TTA, PU5DUD, etc. 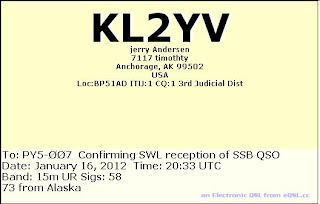 eQSL recebido: KL2YV, Anchorage, AK, United States, 21 MHz, QSO w/ PP5BS. 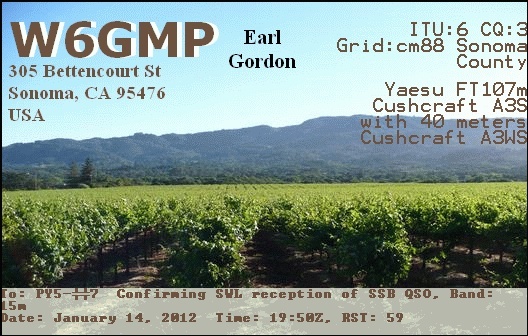 eQSL recebido: W6GMP, Sonoma, CA, United States, 21 MHz, QSO w/ 3DA0NJ. 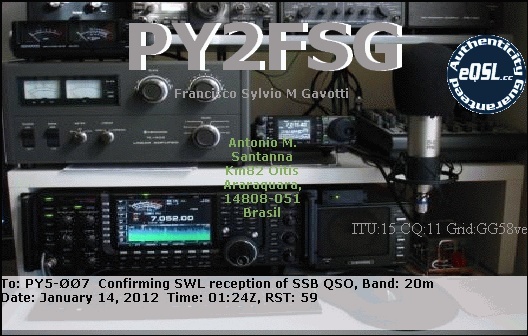 eQSL recebido: PY2FSG, Araraquara, SP, Brasil, 14 MHz, QSO w/ HS0ZJU. eQSL recebido: LW4DVA, Quilmes, República Argentina, 21 MHz, QSO w/ 9Y4LAS. 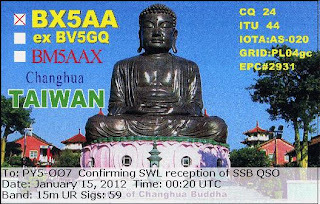 eQSL recebido: BX5AA, Changhua, Taiwan, 21 MHz, QSO w/ XE1AY, VA7FC. 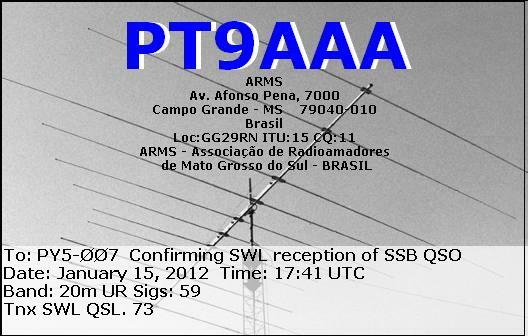 eQSL recebido: PT9AAA, Campo Grande, MS, Brasil, 14 MHz, QSO w/ PY1EUN, PY1PDF, PY2CYA, PY2BJO, PY3WY, PY2LE, PY5AFW, PY9BKW, etc. 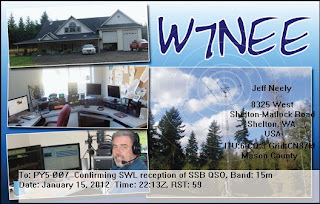 eQSL recebido: W7NEE, Shelton, WA, United States, 21 MHz, QSO w/ 9Y4LAS. 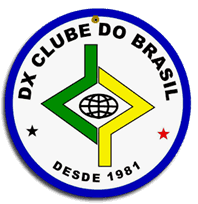 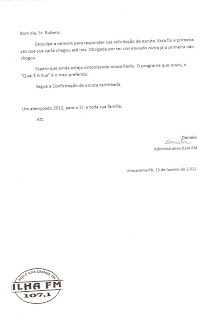 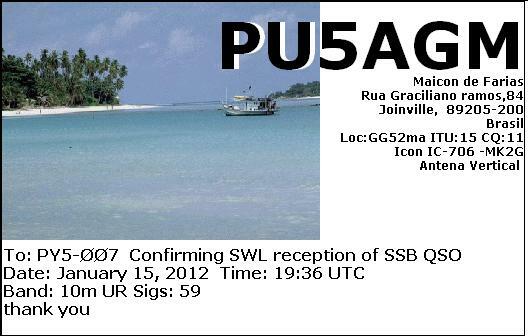 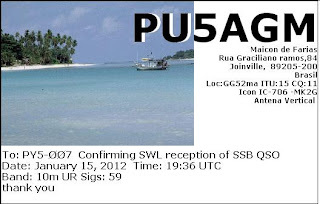 eQSL recebido: PU5AGM, Joinville, SC, Brasil, 28 MHz, QSO w/ PP6PP. 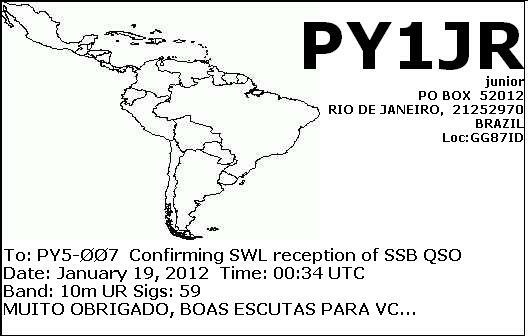 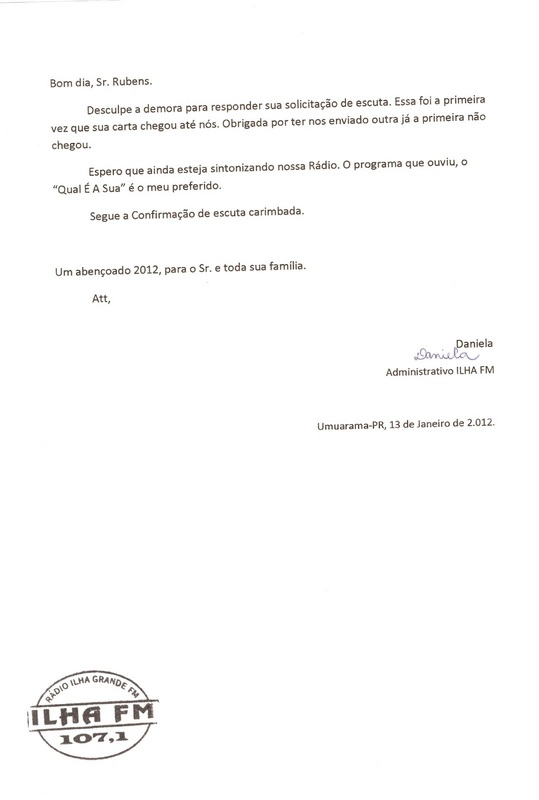 eQSL recebido: PY1PDF, São Gonçalo, RJ, Brasil, 14 MHz, QSO w/ PT9AAA. 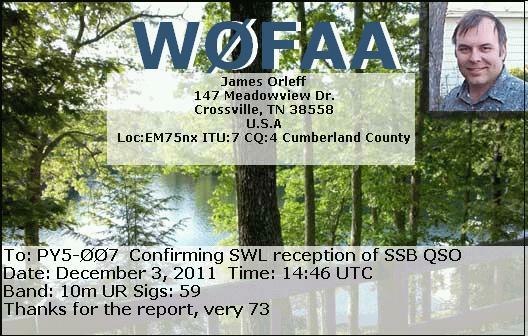 eQSL recebido: W0FAA, Crossville, TN, United States, 28 MHz, QSO w/ 9A9A. 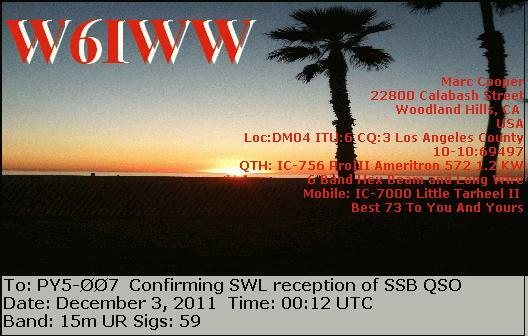 eQSL recebido: W6IWW, Woodland Hill, CA, United States, 21 MHz, QSO w/ JA3CZY.